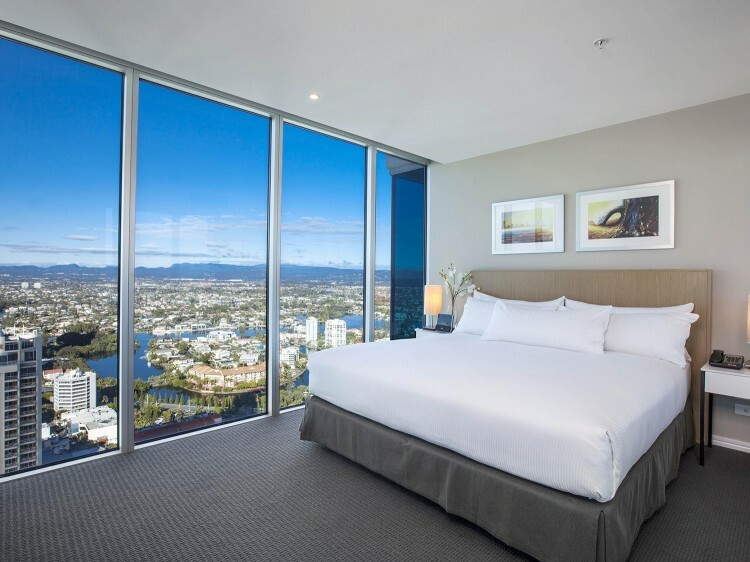 Enjoy the view from vast windows framing a panorama of the beautiful Gold Coast Hinterland and Surfers Paradise skyline. Features a modern kitchen and laundry, city or hinterland views, balcony and king size Hilton Serenity Bed. Average floor space 70m2. Spacious contemporary living featuring separate living and dining areas, balcony with city or hinterland views, modern kitchen and laundry. Average floor space 85m2. 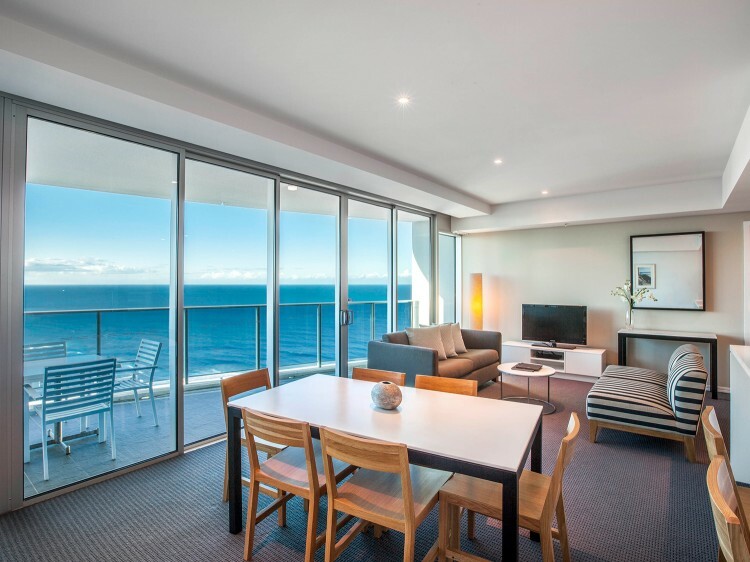 Soak up some of the most spectacular ocean views on the Gold Coast from panoramic windows. Spacious contemporary living featuring separate living and dining areas, balcony with ocean, beach and city views, modern kitchen and laundry. Average floor space 100m2. Located on the upper floors of the hotel (level 33 and above) a 2 Bedroom Sky Residence takes indulgence to a whole new level combining the exceptional benefits of a modern kitchen and laundry, separate living and dining areas, private balconies and over-sized bathrooms. 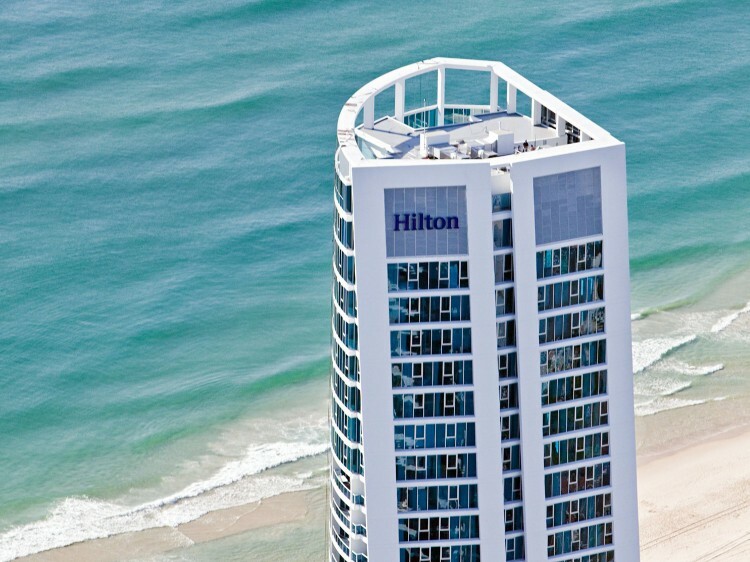 Enjoy the picturesque ocean, beach and city views as you soar more than 80 metres above the spectacular city. Average floor space 100m2. 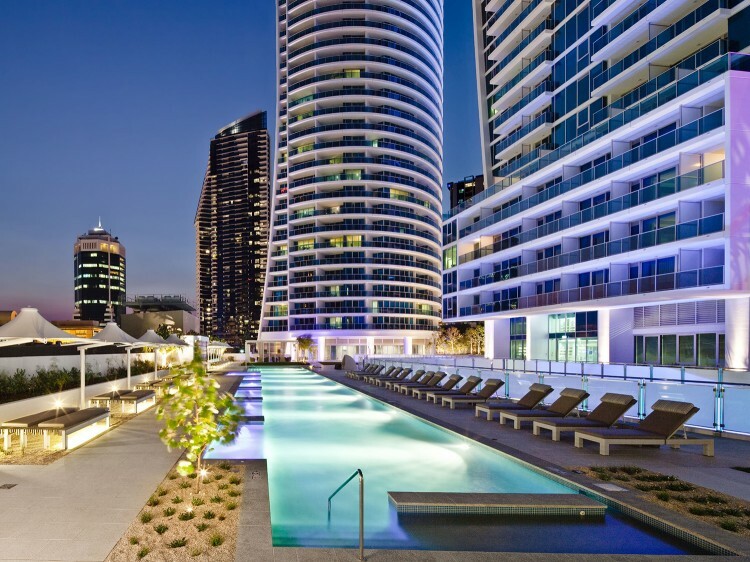 The panoramic views over Surfers Paradise are just the beginning. With three bedrooms and two bathrooms, space is abundant – and rooms are infused with natural light through the vast windows. Ocean, beach and hinterland views. Average floor space 115m2. This spectacular Residence is ideal for families and groups, comfortably sleeping up to 10 people. Ocean, beach and hinterland views. Average floor space 145m2. Experience the sheer indulgence of this breathtaking four-bedroom, five-bathroom Sub Penthouse featuring mmaculate design, awe-inspiring views of the Pacific Ocean, a 'Personal Valet' to assist with every aspect of your stay, designer furniture and art pieces, built in surround sound, and state of the art mood lighting. Located on the top floors with spectacular ocean and city views. A credit card will be requested upon check-in as a form of security deposit. The hotel carpark is located approximately 30 metres along Orchid Avenue on the left hand side. Self-parking $15 per day or Valet parking $30 per day (prices subject to change without notice).